Is the new Facebook Beacon platform just a PR move to let them get away with more? And here's round two. Users will be pissed. I'll get emails from MoveOn.org. 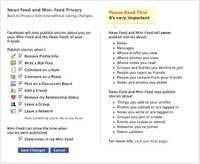 And the benevolent facebook will add the additional privacy features that they expected in the first place. Advertisers win and the users feel heard. Friggin brilliant. It's a good platform for everybody anyway (assuming the control stays where we all know it should). Them some smart dudes. You may have also noted that MySpace rolled out its own feed this week, also. We've got to realize that people put information on their page when they don't mind if other people see it. What's important is that users retain control of the data. Calacanis has more. Nice one, Paul. It will be interesting to see how this plays out ... I have a feeling that goodwill only lasts so long. Those brands/companies/apps that forget to listen will find themselves subject to a mass exodus. Hey, it happens in real life as we find new places to hang out. It will happen online too. I don't know what's private and what's not anymore, and I'm not sure there really is a way to know for sure. Closing Up Shop Just for the day, though. As of midnight tonight, it's blog nothing day in support of the writers. As Dino from Chroma said, "just because we make no money doing this, doesn't mean they shouldn't!"